Shrimp paste, made with fermented shrimps and salt, is the foundation of many Southeast Asian dishes especially in Indonesian and Malaysian cuisines. 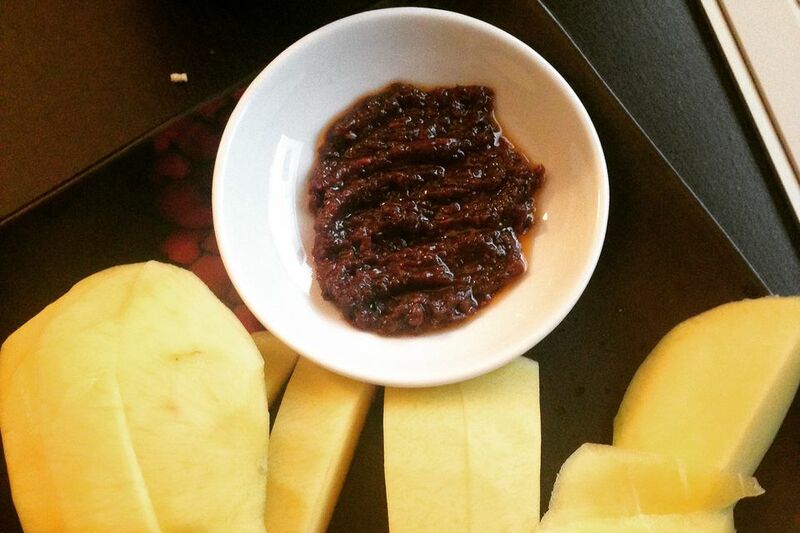 Called belacan in Malaysia, it is also known as terasi in Indonesia, mam ruoc or mam tom in Vietnam, kapi in Laos and bagoong in the Philippines. Shrimp paste may be wet or dry and the color varies from pale pink to deep reddish-brown. Adding a small amount of shrimp paste to a dish gives it a rich flavor. Belacan is a shrimp paste in dry form made from the small crustaceans called krill, a bottom-feeder that lives on phytoplanktons and zooplanktons. Before it is added to a dish, belacan must be roasted to release its flavors and aroma. There are various methods to cook dried shrimp paste or belacan. Many generations ago, before the advent of modern cooking equipment, housewives used ‘portable’ charcoal-fired stoves to toast the belacan. They used two pieces of solid wire netting attached to a handle to grip slices of the belacan which they would laboriously turn over an outdoors charcoal flame until the belacan was evenly barbecued on both sides. Things have moved along a bit since then. Here are three simple and popular methods for roasting belacan. Cut belacan into thin slices. Preheat oven to 375 F. Place the belacan slices slightly apart on a roasting pan. Roast for about 4 to 7 minutes or until the edges start to brown. Let it cool before use. Note that roasting belacan this way will make your kitchen smoky and smell strongly for some time. Leaving the windows and doors open will help to clear the odors. Leave the oven door open after you have finished roasting the belacan and clean the oven with a good detergent to clear away any lingering odor. Without using any oil, fry the thin slices of​ belacan until they are brown and the pungent smell of the belacan is released. Check to see if they have been well cooked by taking a slice and breaking it in two. It should break like a crisp biscuit and the inside should be brown and dry and not soft. If you are in a hurry, you may fry the belacan in some oil using a wok or frying pan over low heat. Ensure that there is sufficient oil so that the belacan does not burn. It may break up into small pieces as you fry it, and that is alright. Just be sure to cook it until well done and golden brown.